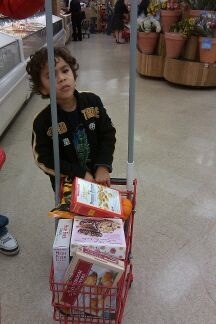 AutismWonderland: Two Supermarket Saturday. Sunday is my Favorite Day. Two Supermarket Saturday. Sunday is my Favorite Day. Our Saturday routine is Sensory Gym, School and Supermarkets. Sensory Gym for The Boy. But after we get home and I unpack the groceries, I wheel my shopping cart back out with The Boy to go to the neighborhood supermarket. Because the organic supermarket doesn't carry the essentials of a Puerto Rican kitchen: pillow sacks of rice (I prefer Canilla) and Goya beans.When we're finished, I make The Boy push our shopping cart the three blocks back to our building. I ignore the looks from other mother's, shaking their heads at me for making a 5 year old push a cart filled with groceries - they don't know about "heavy work." This morning, we woke up at 6:45. It's a crisp Sunday morning, I wrapped in soft blankets, I can smell the chill in the air. It's what I love best about Fall. The Boy must like it too because he bounced into our bed after turning on the light and said "Rise and Shine. It's my favorite day!" I asked The Boy what day is today. To which he replied, "Monday!" Yeah...not so sure about that one. I told him it was Sunday. And that Sunday was my favorite day. Especially a Sunday like today. My laundry is almost finished. I ran all my errands yesterday so if I don't want to leave the apartment, I don't have to. And I get to spend today doing only the things I want to do. 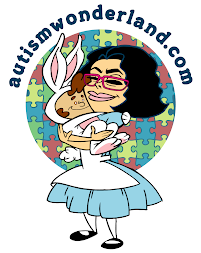 Have you voted for AutismWonderland for Parents Magazine Best Special Needs Blogs? Voting ends on October 15th. Please vote and help me continue sharing our stories, providing information and creating awareness. Just click on the pink box on the right side. Or click here.